Toad in the Hole is one of our favorite healthy breakfast recipes. It uses simple ingredients to make a breakfast that is tasty, delicious, and fun! Add some fruit on the side, and you have a complete breakfast! This is easy enough for children to make on their own, with some supervision. This Toad in the Hole recipe makes one serving, and is easily multiplied. While it heats, butter the bread on one side. Cut a circle from the middle of the bread. Put a dab of butter in the center of the skillet. Place the bread, butter side down, into the warm skillet. 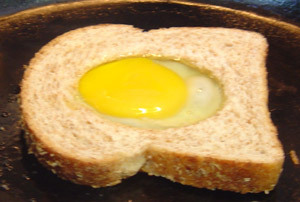 Gently pour the egg into the hole. Break the yolk, or not, as you choose. Sprinkle the egg with salt and pepper, to taste. When the egg has set, flip it over and cook the other side briefly. Use your favorite bread in place of the whole wheat. According to my family, this recipe is perfect as it is! If you have any ideas to improve upon it, please let us know! I use a cast iron skillet to make this dish. Cast iron is the best non-stick cookware there is! If you don't have a non-stick pan, you may need to put some extra butter or oil in your pan to keep your Toad from sticking. If you (like me) have a child who doesn't like yolks, remove the yolk and use just the white. An egg separator works well for this job. Save the cut-out circle of bread and fry it separately. My kids love to eat these! Return from Toad in the Hole to healthy breakfast recipes.